Historically in the construction industry, a lot of work is carried out designing, constructing and planning for new assets and their associated asset management. Too often assets are built and this knowledge and planning is wasted as insufficient resources and effort are deployed to ensure the longevity of the asset. The implementation of Building Information Modelling (BIM) on UK construction projects will foster the implementation of better asset management for ‘blank canvas’ schemes as data is generated, and forecast maintenance is intelligently managed. The challenge remains for how we apply this logic and improve asset management on historic or adopted assets, which are already deteriorating and where critical information about these structures has been lost over time. JBA Bentley has undertaken best practice methods to rise and meet this challenge with the Environment Agency, through the works undertaken on the Waterways Asset Repair Programme of Works, by creating an integrated digital asset management model. This has combined digital, visual, and historic survey information to create an asset model that combines as built and condition assessments as well as operational and construction health and safety hazard information. By nature, waterways lock structures, such as Wadenhoe lock on the River Nene, are large historic structures readily used by the general public for navigation and recreational purposes. Their historic nature means that they are already substantially along their life cycle curve. As these assets are used and trafficked by the public, it is of paramount importance that their structural integrity is maintained and monitored in the most appropriate way, all the while serving its original function. JBA Bentley undertook a series of lock drain downs, inspections and repair works as necessary. The locks are located across various navigable rivers and vary in construction while the accuracy of as built information was limited. Enabling works to conduct the drain downs presents significant health and safety risks which also have the potential to compromise the structural integrity of the lock. Typically, propping for the lock is required during a dewatered state to prevent structural failure from lateral earth/water pressures. For this reason, the construction of the lock structure had to be established. JBA Bentley was advised that this could be one of two types of lock – either a mass fill concrete or reinforced concrete lock chamber. Generic drawings for each type of lock were provided by the Environment Agency. Conscious of not using any intrusive techniques on an aging asset, JBA Bentley took an approach whereby non-intrusive techniques could be utilised to assess the lock type. Surveys were undertaken including desktop searches, a geophysical and a cover meter survey as well as a Ground-Penetrating Radar (GPR) survey to collect as much information as possible. These surveys established that Wadenhoe Lock was of mass poured concrete construction and enabled the correct assessment of the effect of lateral earth/water pressures on the structure. 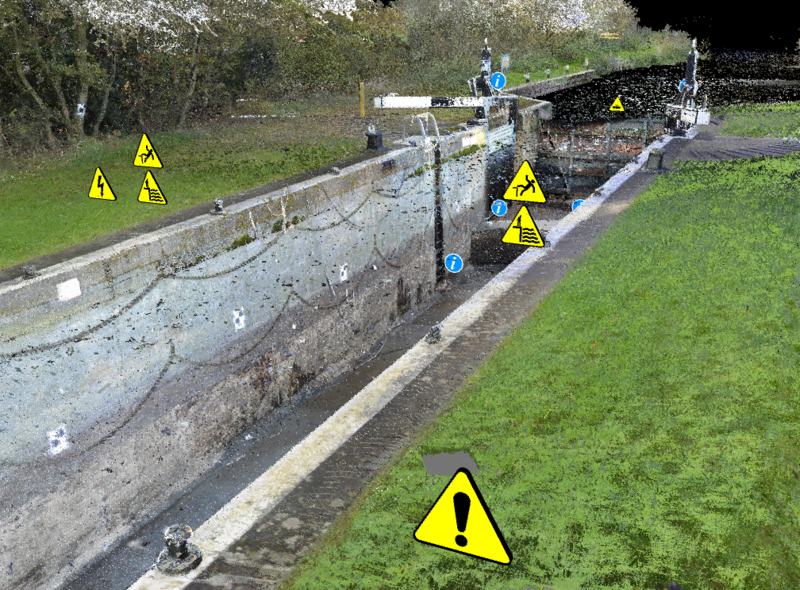 Once works on site had begun and the lock was drained down, a detailed structural assessment was undertaken to evaluate the condition of the lock chamber and identify any elements requiring remedial works. 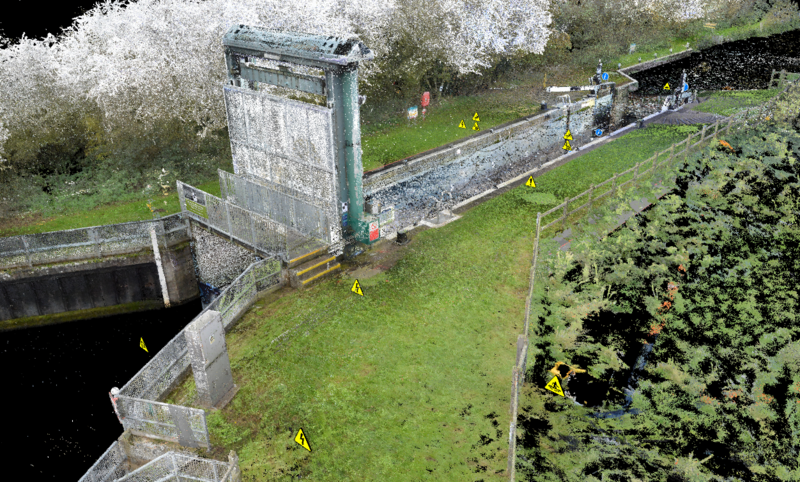 Concurrently, a point cloud survey of the lock chamber and superstructure was undertaken. 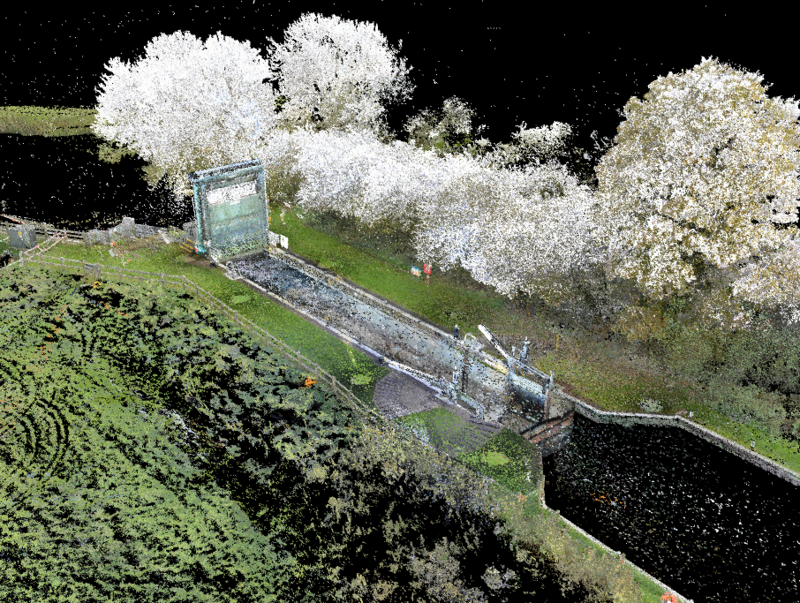 Once works on site were complete, the final deliverables were point cloud and photogrammetry models provided in accordance with the Environment Agency’s BIM Employers Information Requirements. The condition report elements: Following on from the structural survey, defects of note were marked throughout the model detailing their condition with associated photographs. These photographs and condition text are geospatially positioned exactly as they were identified on site, a task often difficult to ascertain or describe in a traditional text report. Detailed dimensional information: The point cloud and photogrammetry outputs provide an accurate platform to take future measurements from and create a baseline for future surveys. Services were modelled in to the deliverable based on the GPR survey carried out. This would give the user an instant appreciation of where these may be, the constraints they may present and their given depth in relation to the asset itself. The substructure: Following review of the cover meter and geophysical surveys against the typical as built information, the established construction of the lock was indicatively added to the model to allow the user to distinguish the lock substructure instantly. Photos of repair works added to the model to show where these were undertaken and serve as a final record for the defects period. The residual hazards associated with the lock in its operating capacity were included within the model to better highlight these to the user. These incorporated different visual symbols to depict different types of hazards as per JBA Bentleys drawing standards. For future works, and planning site visits and future works, the photogrammetry model provided a clear record of on-site risks and access constraints. Dynamic features within the model that would not be best portrayed in photographs were captured in videos and added to the model. Specifically, these included areas of running water to allow for an appreciation of flow and hydrostatic pressures. Managing a historic asset in this way has a vast potential to offer value as it creates a baseline and a single source of information. All works on the asset going forward can be compared against the baseline to identify change as well as capturing information about the asset that can inform future decisions (such as underground services and the lock structure itself). The condition assessment and accuracy of information represent value for money in future works and repairs that may be required, reducing the need to visit site to re-verify information. Due to the high costs of draining a lock down, this information will be available prior to future works and inform of previous repairs and problems the asset has experienced. Email Tom Geddes for more information on the project. You can also find out more on our engineering web pages or on the JBA Bentley website.